All living organisms are made up of one or more cells. The cell is the most basic unit of structure, function, and organization in all organisms. All cells are made from other, existing cells. All living organisms are made of cells. Single-celled organisms do not contain organ systems, organs, or tissues. Eukaryotes have nuclei, prokaryotes do not. The main difference between plant and animal cells is the presence of a cell wall. Also animal cells don't have chloroplasts. Cellular respiration occurs in the mitochondria, which is found in both plant and animal cells. 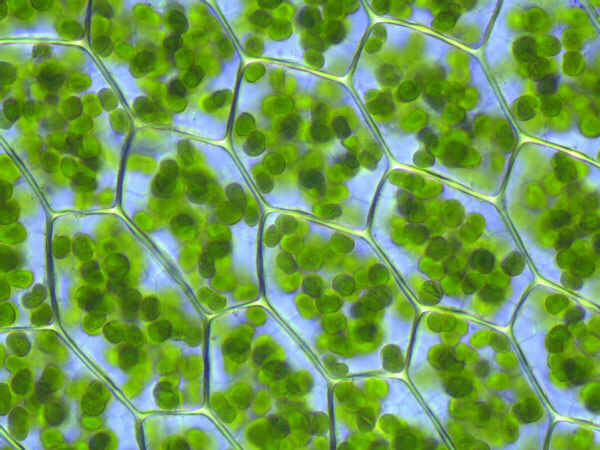 Photosynthesis occurs in chloroplasts, which are only found in plant cells. Cellular transport throughout the cell occurs with a process called diffusion. Diffusion is the transport of molecules across a gradient of high concentration towards lower concentration in a fluid. This manufacture of energy from sugar occurs in the mitochondria. The powerhouse of cells. Interphase: DNA is copied and the cell grows to prepare for cellular division. Prophase: the chromosomes condense into visible forms under a microscope. The final phase is cytokinesis, which the cell is split into two daughter cells. (Technically this is not the longest phase of mitosis because interphase is not considered a part of mitosis-PMAT). The nuclear membrane dissolves during prophase. Chromosomes line up at the middle of the cell in metaphase. The chromatids separate to opposite sides of the cell in anaphase. The chromatids rearrange at opposite ends of the cell in telophase and nuclear membrane forms. Draw the following stages (not shown): interphase, prophase, metaphase, anaphase, telophase, and cytokinesis. Cell → Tissue → Organ → Organ System → Organism. Tissue: cells that perform a similar function. Tendons connect muscle to bone, and ligaments connect bone to bone. Stem cells are considered pluripotent. While egg, or reproductive cells could divide into many different cells once fertilized, it is the stem cells that directly split into different types. Stem cells is the most correct answer choice. Bone marrow, and umbilical cord blood from newborns. Muscles cannot exert a 'push' force. Muscles only have tensile strength. The musculoskeletal system does not include smooth muscle. Smooth muscles are part of involuntary muscle groups... like the digestive (GI tract), urinary (bladder), or circulatory systems (blood vessels). Musculoskeletal muscle is voluntary (somatic), but smooth muscle involuntary (autonomic). True. (Animals have to respire actively with the diaphragm, whereas plants don't have to do anything, they passively respire through the stoma by the concentration gradient of gases). Careful, capillaries carry both oxygenated and deoxygenated blood, which undergoes gas exchange through diffusion. Carbon dioxide and other metabolic waste processes in deoxygenated blood are carried away in the blood stream. Plasma is about 55% of blood volume, and red blood cells are 45%. Plasma contains plasma cells, electrolytes (ions such as Ca2+, Na+, HCO3-...), proteins, hormones, dissolved gases, and more. 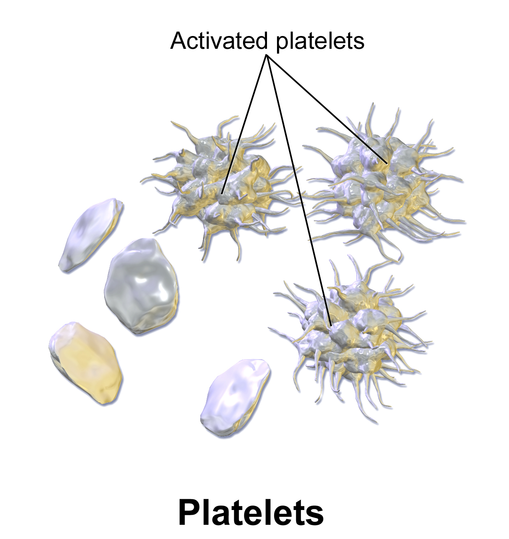 Platelets form a web-like matrix when activated, to clump and clot. This is good when sealing wounds, but bad when clumping occurs inside important blood vessels. True, red blood cells and platelets do not have a nucleus. (White blood cells do have a nucleus). Muscle, nerve, and connective tissue. Arteries are defined as blood vessels that carry blood away from the heart. However, arteries do not always carry oxygenated blood. An example of arterial blood that is not oxygenated is the blood travelling from the heart to the lungs. The right atrium (on the right side of the heart) receives deoxygenated blood from the superior vena cava. Transport gases like oxygen and carbon dioxide between the lungs and the body. Transport nutrients like vitamins, minerals, and glucose. Transport metabolic wastes out of cells. Fight against infections. Trachea is part of the respiratory system. The accessory organs of the digestive system includes the: liver, gall bladder, and pancreas. While some absorption occurs in all different areas, water absorption occurs mainly in the large intestine. Nutrient absorption occurs mainly in the small intestine. The brain is part of the central nervous system. The peripheral nervous system is the nerves that connect the rest of the body to the central nervous system. The dendrites, nucleus, cell body, myelin, and axon come together to make up the neuron cell. The circulatory-respiratory interaction occurs at the ______(I)______-alveoli boundaries. The gas exchange occurs with ______(II)______ moving from the respiratory (alveoli) to the circulatory system (capillary), and carbon dioxide moving from the circulatory (capillary) to the respiratory system (alveoli). The gas exchange is driven by the concentration ______(III)______ of gases, always from high to low concentration. This movement of blood is driven by the ______(IV)______. The circulatory system collects many different metabolic waste products from the body, including carbon dioxide. The heart pumps deoxygenated blood to the ______(V)______, then pumps the oxygenated blood back to the heart to be distributed to the body again. The circulatory-respiratory interaction occurs at the capillary-alveoli boundaries. The gas exchange occurs with oxygen moving from the respiratory (alveoli) to the circulatory system (capillary), and carbon dioxide moving from the circulatory (capillary) to the respiratory system (alveoli). The gas exchange is driven by the concentration gradient of gases, always from high to low concentration. This movement of blood is driven by the heart. The heart pumps deoxygenated blood to the lungs, then pumps the oxygenated blood back to the heart to be distributed to the body again. Carbon is one of the major macronutrients in plants. Carbon dioxide, CO2, from the air. While many of the answer choices appear correct, the plant with the fastest growth would use (sequester) carbon with the fastest rate. Since carbon is one of the major macronutrients in plants, it is required for use in many things, including growth. Fast growing plants is an indication of high CO2 use. A by-product is a secondary product made during the manufacture or synthesis of the main product. Energy is produced through cellular respiration and one of the main by-products is carbon dioxide, CO2. Plants photosynthesize energy from the Sun into sugar (glucose), which is stored in the plant cells for later energy use through cellular respiration. It is true that cellular respiration occurs both day and night. This process is necessary in both plants and animals to produce the energy required to sustain life. Carrot taproots and potato tubers store starch, which comes from the glucose sugar produced in the chloroplasts in the leaf organs. This sugar is transported by the vascular tissue system from the leaf mesophyll (ground tissue system) down the phloem tissue. Copy the different classifications, for use up ahead... It's tricky to go without this. True. Stomata are pores in the surface of a leaf that allow gas exchange: oxygen, carbon dioxide, and water vapour. The cells that regulate the opening and closing of these pores are called guard cells. The cuticle is the outer layer of the plant tissue and is necessary to protect against infection and to prevent the plant from drying out. 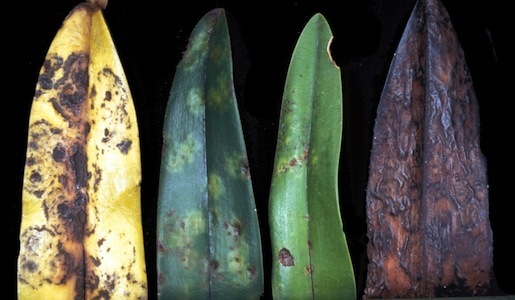 A thick, waxy cuticle would protect a plant from many things, including protection from water loss in hot, dry, or cold conditions, and to prevent the plant tissue from disintegrating in wet environments. The root system is responsible for absorbing nutrients and water for the plant, and for structural support. The shoot system is made of the rest of the plant (stem, leaves, and flowers) and is responsible for photosynthesis and reproduction. This is not one of the plant systems: "Chlorophyll tissue system". No such thing, it's false. Vascular tissue system consists of xylem and phloem. True. Cell division in plant cells occurs in the meristems. The xylem tissue is found in all three plant organs: roots, stems, and leaf. Its purpose is to distribute water and minerals from the roots to all other regions of the plant. Xylem can only transport water and minerals upward. Roots absorb water and dissolved minerals, transported up the xylem (not phloem). When you water a plant, or give it fertilizers, it is absorbed at the root and being transported in the xylem system only. Photosynthesis produces glucose in the mesophyll in the leaf, transported down the phloem (not xylem). Plant genes are DNA, which encode for proteins. Genes are not proteins themselves. The selective expression creates different sets of proteins in different cell types. Genetically engineered crops are more resistant to weather and some pests, resulting in higher yields, and reducing the use of harmful pesticides. Genetic engineering is entering into uncharted territory where we may not fully understand the long-term health implications, or may be missing/overlooking some crucial problem. An organism, such as an Amoeba or Paramecium, which is made of only 1 cell. What is one of the main differences between prokaryotes and eukaryotes? What is the main difference between plant and animal cells? What cellular organelle is used for transport within the cell? Which organelle is used for metabolism? Can cellular respiration occur in plants? Do animal cells contain chloroplasts? In which phase of cell division do the chromosomes first condense? What is the longest of the cellular phases? Is interphase part of mitosis? In what phase of cell cycle do the chromatids split apart? 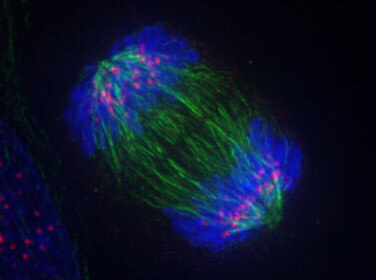 How is cell division involved in cancer? Cancer is linked with uncontrolled/unregulated cell division at an increased rate. Which type of tissue is described as long, thin cells that conduct electrical impulses? The heart is an example of what type of tissue? Which tissue lines the digestive tract? Bone is an example of what type of tissue? What tissue connects bone to bone? What are two sources of stem cells in humans? What type of muscle contracts involuntarily? How do the diaphragm muscles control breathing? What are the sites of gas exchange in the lungs? How are veins and arteries defined? To transport metabolic waste products away from the cells and to transport oxygen and nutrients throughout the body. What component of blood occupies the most volume? Plants respire through the stoma through what process? What are the byproducts of cellular respiration in plants? What molecule does a plant use to store its energy? Ionic = transfer of electrons between metal + a non-metal. Molecular/covalent = sharing of electrons between two non-metals. Covalent, molecular compounds form between two non-metals. Sodium and calcium are metals. Carbonate is a charged, polyatomic ion. Neon is a noble gas and doesn't bond. Metals cannot make covalent compounds. A binary compound is made out of only two (different) elements. The subscript does not matter. Molecular compounds consist of covalent bonds in which electrons are shared between 2 or more non-metals. Convalent compounds cannot contain ions (like SO42-, or CO32-). Calcium is in group 2 on the periodic table. Group two elements have two valence electrons that are both lost when these elements form ions--turning into cations. Chlorine and bromine are halogens, which tend to gain electrons to form negative anions. Ions that form the same charge do not bond. The ions in ionic bonds must be oppositely charged: a cation, then an anion. Magnesium is a metal, and will always form a cation (positively charged ion). This must react with an anion (negatively charged cation) in the right ratio. Name the following compounds, using the prefix system. 2 molecules of aluminum nitrate have 18 oxygens. Know the formulas of the basic compounds, hydrogen, oxygen, and water. It is common and not considered incorrect, for the word equation to include 'water' instead of 'dihydrogen monoxide'. Write the chemical reaction for the following pseudo-word equations. Make sure to balance the equation and include the physical states. Think about the types of intramolecular bonds and how this is related to dissolving. Think about the definition of a chemical change, versus the definition of a physical change. Sodium chloride NaCl(s) is a salt, and the ionic bonds between the 'Na' cation and 'Cl' anion are broken apart when they dissociate in the solution. Chemical changes change the bonding of the molecules, while physical changes do not change the bonding. See the difference between the two reaction equations... Only one breaks apart. The sugar molecule C6H12O6 (s) has covalent bonds so does not break apart when it is dissolved (solvated) into water. Physical changes only change the phase state of a compound without rearranging/changing any bonding, e.g. just solid to aqueous, or gas to a liquid. Chemical changes are a change in the chemical bonding in a substance. When ionic compounds dissolve in water, they separate into their aqueous (aq) ions (positive cation, and negative anion) and this is considered a chemical change. While heating the water may change the phase from liquid to a solid, in a closed container the amount of matter is constant so there will be a constant mass. Increasing the kinetic molecular energy of the water atoms will not decrease their mass. Total mass of the reactants equals the total mass of the products. Mass is 100% conserved in an isolated (insulated and closed) system, and in a closed system the mass is conserved by close to 100%. The law of conservation of mass states that for any closed system (to transfers of matter and energy) the mass of the system is conserved. Think about what goes into a reaction, and where the mass might come from. The increase in mass is due to the oxygen gas from the air, bonding to the copper. For example with an initial amount 10.0g of solid copper, the final mass of CuO would be 25.04 g ! 10.0g of reactant is still forming 10.0g of product, it's just that some of the product is a gas that doesn't get included when the products are weighed on the scale in the lab. There are 7 general types of chemical reactions. Most people are only responsible for the first 4 or 5 main reaction types in this list. A chemical reaction occurs when bonds are broken or new bonds are formed. Vaporization is not a chemical reaction because the atom or molecule does not change bonding in any way if it's just a phase change. Complete the synthesis reactions, then balance. (Practice naming the products in your own notes). Complete the synthesis reactions, then balance and name the products. A metal or metallic oxide will react with oxygen or carbon dioxide to form an ionic compound. A non-metallic oxide will react with water to form its resulting acid. A metal or metallic oxide will react with oxygen or carbon dioxide to form an ionic compound. A non-metallic oxide will react with water to form its resulting acid. Oxygen forms a diatomic gas, O2. This is a decomposition reaction. Complete the following double displacement reaction. The solution is basic (alkaline) when the concentration of hydroxide ions, [OH-] is greater than the proton or hydronium ions. This is because in the same container with the same volume, the total number of moles of the alkaline hydroxide makes the solution alkaline overall. Acids: sour, corrosive to metals, turns blue litmus red. Bases: bitter, feel slippery, caustic to living tissues, turns red litmus blue. Stomach acid (HCl), Vinegar, Rainwater, Distilled Water, Baking soda, Household bleach. An acid + base neutralizes. This would be mixture C.
Lye, NaOH is a Base. Alkali earth metals are located in what group? Both of these elements tend to gain electrons and become negatively charged. These similar charges would repel. What is the Sulfide ion? What is the chemical formula of the carbonate ion? What is the chemical formula of the ammonium polyatomic ion? When an ionic compound dissociates by dissolving in water, is this considered a physical or chemical change? This is a chemical change because the chemical bonding of the molecule is changing. Is this acidic or basic? What are the products of a neutralization reaction between an acid and a base? 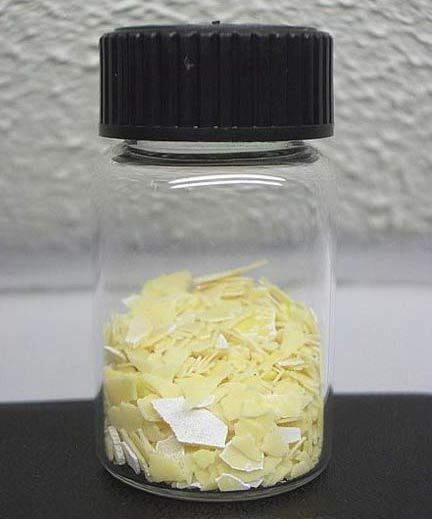 What is the common name of this acid? Radiation is the only form of energy transfer that can occur in the vacuum (no particles/molecules/things) of space. Radiation can also occur in the atmosphere. Radiation is light, for example the light from the Sun or from the fire of candle. Convection can occur in the air of the atmosphere or the water of oceans/lakes/rivers, but not in the vacuum of space because it depends on the presence of particles/molecules/things to move around. Conduction can only occur in solid things, like the ground. The lower regions are more dense because the weight of the particles above compacts the particles more below. troposphere ↔ tropopause ↔ stratosphere ↔ stratopause ↔ mesosphere ↔ mesopause ↔ thermosphere. Weather and air are only located within the troposphere. The ozone (O3) that protects life from harmful radiation from the Sun is located in the Stratopause. The mesopause reaches the coldest temperatures. Many people (incorrectly) think it's the top layer. The lapse rate increases in the stratosphere and thermosphere. It decreases in the troposphere, and mesosphere. The order of the spheres and pauses from low to high are: troposphere ↔ tropopause ↔ stratosphere ↔ stratopause ↔ mesosphere ↔ mesopause ↔ thermosphere. Life can be found below ground, living within the lithosphere. Life can also be found floating in the air (atmosphere) in small particles, or flying as larger animals. Life can also be found living in the water systems (hydrosphere). In soil there can be: rock, water, air, and life. It is true that clouds (water) is part of the hydrosphere (rather than the atmosphere). Actually the part of clouds we see are made up of droplets of water that have condensed from gaseous vapour into liquid form. Cold air holds less water than warm air. Water can evaporate more in warm air, and when this air cools some of the vapour condenses out of the air into the liquid phase. The phase changes of water in the water cycle are caused by heat (changes in temperature) from energy coming originally from the sun. This is all true except one thing: that fluid (liquid and air) moves always from high to low pressure. Climate, or "weather conditions" depends on a number of factors such as temperature, humidity, precipitation levels ... Regions in similar latitudes experience similar conditions. While some of the other answer choices do contribute to the carbon in the atmosphere the main source is outgassing and volcanoes. 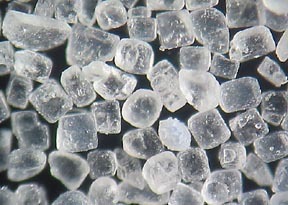 The other main sink is ocean sedimentation of carbon-containing matter, such as shells and other biomass. In the northern hemisphere, wind deflects to the right due to the Coriolis effect. The rotation of the Earth causes the Coriolis effect, so if there was no Coriolis effect then the trade winds would not curve down and westbound, instead they would just go straight downwards. Actually life on earth would not survive without the warmth that greenhouse gases provide. Greenhouse gases have been around and are almost as old as the Earth itself. However an important balance exists and if the anthropogenic ("manmade") greenhouse effect gets too strong, then it could become dangerous. (Albedo is the proportion of the reflection of incident light on a surface). Ice, snow, and clouds are main ones. Dry sand reflects more light than water. So water does not contribute largely to the albedo effect. Can convection occur in a liquid or a gas? What is the only form of energy transfer that can occur in space? How does the density of the upper atmosphere compare the density of the lower atmosphere? Which layer of the atmosphere contains the Ozone layer? The change in air temperature divided by the change in altitude is what calculation? Lapse rate decreases in what 2 layers of the atmosphere? In which layer does weather and all the breathable air exist? Water vapour condenses as moist air masses rise and cool. Convection always moves a fluid in what direction? What causes the trade winds in the northern hemisphere? What is the most abundant greenhouse gas in the atmosphere? True. This is why light energy can travel through the vacuum of space from our Sun to our Earth. Order: Gamma, Ultraviolet, Visible, Microwave, Radio. This is considered basic, required knowledge for your class this year. Luminous sources produce their own light, like fire. Whereas metal, diamond, glass, and water only reflect light from other sources, rather than producing light. Electric discharge is the production of light when electric current flows through a gas (air, or noble gas) and causes the gas to glow. The natural example of this is lightning. Neon signs and fluorescent lamps use electric discharge - electricity flows through various gases to produce light. Fluorescent lamps require one extra step to make the light visible to us. Triboluminescence is cool. It can be observed when quartz rocks are shaken vigorously in a dark environment. Phosphorescence pigments (phosphor) absorb light energy (often spectrums we cannot see, e.g. ultraviolet light) and store and release this energy for a certain amount of time. Fluorescent light bulbs must be coated in a fluorescent material that converts ultraviolet light to visible light. Electric current provides the energy that excites electrons in Mercury atoms. When these electrons in the Mercury atoms transition, or change back, light is emitted in the ultraviolet spectrum that we cannot see. This ultraviolet light then excites a fluorescent pigment (phosphor) coating around the bulb, that converts the ultraviolet light to light in the visible spectrum that we can see. Fluorescence uses electric discharge to create ultraviolet light that gets converted to visible light. Incandescence heats up a material that emits visible light. Bioluminescence is light produced from the energy stored in chemical reactions, within living organisms... it is a type of chemiluminescence. This is an efficient energy source as there is a low percentage of energy emitted/wasted as heat. Water is transparent. Transparent things allow light to pass through completely. The angle of incidence (θi) of a light ray is equal to the angle of reflection (θr). Both angles are measured from the normal, which is a perpendicular line of reference from the surface of the mirror. The incident ray, reflected ray, and normal all lie in the same plane. Images in plane mirrors are virtual. Different curriculums use different acronyms to describe the characteristics of an image. Define the acronym used by your class below. Real images form on the same side of the mirror that the light goes to. Virtual images form on the side of the mirror that the light cannot go to. Convex mirrors never produce real images. Refraction occurs when the transmission of light across a boundary between two media of different densities is accompanied by a change in the speed, and wavelength of the wave. For example, when the light slows down, the wavelength decreases. This causes the light wave to 'bend' away from the normal, increasing the angle of refraction. The angle of refraction depends on the initial angle of incidence, and if the angle of incidence is parallel to the normal then the light does not refract. The incident ray, the refracted ray, and the normal all lie in the same plane. E.G.) Glasses and contact lenses refract the path of light to correct near-sighted or far-sighted vision. On a dark night, when you look outside a window and see your own reflection, at the same time refraction is occurring from the light traveling from the bright room to the outside. Or during the day, seeing your reflection in the water at the same time as seeing anything under the water surface. As light enters a denser medium, the angle of refraction is less than the angle of incidence. The quarter appears farther (dashed white line) than it actually is. True. This is due to the angle of refraction of the light traveling from the object underwater to the observer above. While the light observed is the refracted light, the eyes and brain imagine the light in a completely straight path without refraction. So you see the image larger, while the brain thinks it is further. This makes it appear closer or larger. Light is refracted by liquid water droplets suspended in the air as it first enters the water drop. Sunlight is white light that is actually made up of red, orange, yellow, green, blue, indigo and violet light. Each colour has a slightly different wavelength, so each colour bends or refracts at slightly different angles. The light is partially internally reflected off the inside of the water drop, gets split up into a spectrum, and refracts again as it exits. To see a rainbow, you have to be standing with the sun behind you. Red light is seen at the top from a water drop higher up above, while violet light is seen at the bottom of the rainbow. A rainbow is a virtual image. Cold, dense air has a greater index of refraction, n than warmer air. As light travels from cold air to hot air (closer to the ground), the light bends in an arc upwards. The eye interprets the light rays to have been straight, which makes the blue light - that was originally from the sky - look as if it came from the ground. This causes the bluish shimmer of a mirage to appear like water at or below ground level. The angle of refraction is measured from the normal to the refracted ray, iii. Index of refraction is calculated by dividing the speed of light in a vacuum, c to the speed of light in a particular medium, v. The speed of light is fastest in a vacuum (like space) is constant, always 3.0 × 108 m/s. The speed of light slows down in other mediums like air or water. When you divide the two you get the ratio, n called the index of refraction. n = c / v Maybe you can tell that this ratio will always be greater than 1.0 ! Since the speed of light is always faster in a vacuum (c) than in any medium (v), then dividing, ... will always be greater than one because the numerator will always be greater than the denominator in the equation shown. In a faster, less dense medium, when the speed of refracted light increases, it bends away from the normal. Light travels faster in emerald. The medium with the highest index of Refraction (n) refracts light the most. This is diamond with a 2.42 index of refraction. You need to know, and use the speed of light: c = 3.0 × 108m/s. Total internal reflection occurs if the angle of incidence is greater than the critical angle. Also, light must travel from a medium with a higher index of refraction (n) to a medium with a lower index of refraction (n). Total internal reflection occurs when the angle of incidence is greater than or equal to the critical angle. θi ≥ θc Note that a 90˚ angle of incidence would be parallel to the plane of the surface and would neither reflect nor refract. (It is not possible for the angle of incidence to be greater than 90˚). 1) Light rays must have an angle of incidence greater than the critical angle for a particular medium. 2) light must travel from a slower (denser, higher refractive index, n) medium to a faster (less dense, lower refractive index, n). For example, this could occur with light travelling from diamond (2.4) to air (1.00) but not from air to diamond. Converging (convex) lenses have the focus on the real side -- the side that the light travels to. Diverging (concave) lenses have the focus on the virtual side -- the side the light does not go to. The parallel ray and the center ray will refract in the lens to produce parallel rays, which will never converge, thus no image will ever form. The image is: magnified, upright, >F', and virtual. The parallel (p) and center (c) rays will refract through the lens and never converge, and therefore an image is never formed. The image formed by a diverging (concave) lens is always upright, virtual, and smaller than the object! The size of the image is always smaller. The attitude (orientation) of the image is always upright. True. Real images are always inverted. Virtual images are always upright. Diverging, concave lenses always produce virtual images, never real images. The image is always upright. Diverging, concave lenses produce virtual images, never real images. The parallel ray will refract and diverge on the real side. On the virtual side, the ray will appear to pass through the focus (f'). Remember the following rules when using the lens equation. di is positive for real images, and negative for virtual images. f is positive for converging (convex) lenses, and negative for diverging (concave) lenses. f = 10cm, do = 20cm. Positive image distance (+20 cm), therefore the image formed is real (as opposed to virtual that would have a negative image distance). di is negative for virtual images. di = -50cm, f = 25cm. f is negative for diverging (concave) lenses. di = -12cm, f = -44cm. Remember the following rules when using the magnification equation. ho and hi (height) are positive when upright, and negative when inverted. do (distance) is always positive. di (distance) is positive for real images, and negative for virtual images. M (magnification) is positive for upright images, and negative for inverted images. hi = -15cm (negative for inverted), ho = 30cm. The magnification is smaller (0.5), and inverted because it is negative. di = -10cm (negative for virtual image), do = 5cm. di = 40cm, do = +40cm. M = -2.5 (negative M means inverted), do = +10cm. di = -12cm (negative because image is virtual), do = +50cm. M = -1.75, ho = -10cm (negative because inverted). Use the lens equation to find the image distance. Use the magnification equation The image is inverted (because negative M), and larger (because absolute value |M| is greater than 1). Chromatic aberration can be seen when a lens fails to converge the different colors of light at the same point. When the different wavelengths of light refract at different angles and focus at different distances, fringes of light (mainly red, 650nm and blue, 450nm) are seen at the edges of images. 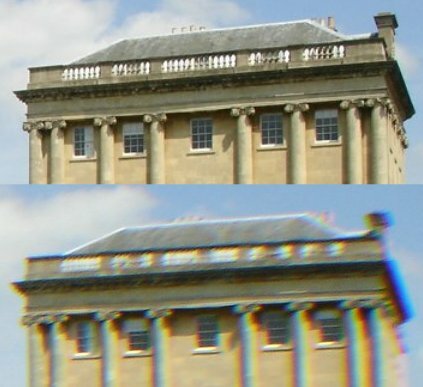 Chromatic aberration is corrected with an achromatic doublet. The first lens is called the crown lens (convex), and the second is called the flint (concave). The flint is used to bring the red and blue wavelengths into focus (achromatic). Bringing into focus means causing the rays to convert at the same point. This is a Galilean telescope. The eyepiece is a diverging concave lens, and the objective is a converging convex lens. 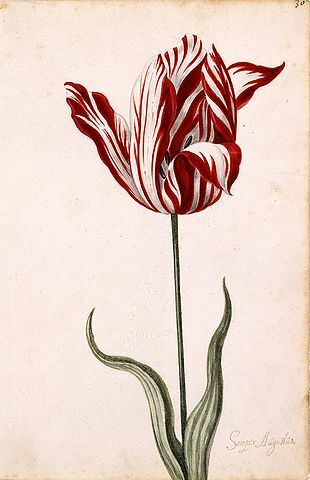 (You can see the image formed, B is: magnified, upright, virtual. This is a compound optical (light) microscope. 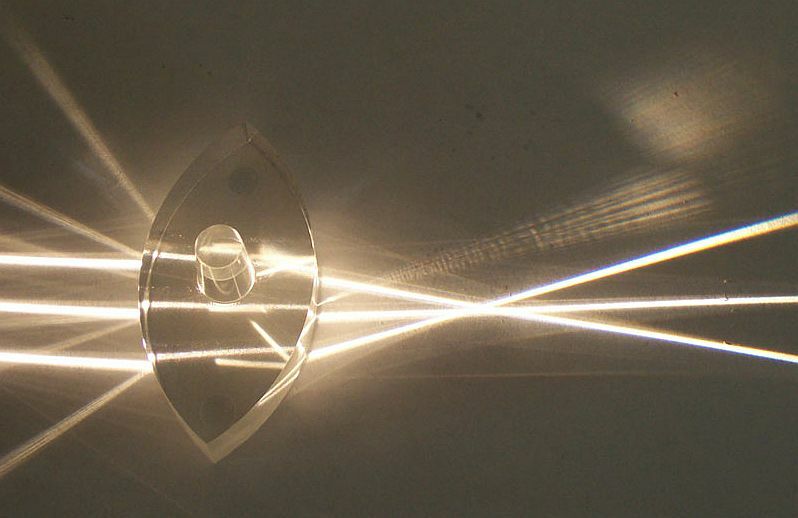 The eyepiece (not shown here), objective, and condenser lenses are all converging, convex lenses. How it works... The objective lens magnifies the image first. Then the eyepiece lens takes this image and magnifies it much more into a much larger, second image. This final image is many times larger than the original object and is a virtual image. True. They both use one objective lens and one eyepiece lens - both are converging lenses. In both cases the eyepiece does most of the magnification, and both final images in the eyepieces are inverted and virtual (the first image in the objective is inverted and real). One of the main differences is the astronomical telescope will have a much greater object distance. The image is formed on the retina, located at the back of the eyeball. Shortsighted/nearsighted (myopic) people can only see objects clearly that are close to the lens because the light rays are not parallel but are more divergent and will converge further back on the retina when the object is closer. The image must converge precisely on the retina to be seen clearly. What is the visible spectrum? The region of the electromagnetic spectrum that can be detected with the human eye. What is a common example of electric discharge? Electric discharge, which is the production of light when electric current flows through a gas (air, or noble gas) and causes the gas to glow. Phosphorescence is the light emitted from glow-in-the-dark pigments, which is a way of storing energy as potential energy of electrons and then slowly emitting this light energy over time. Fluorescent lights contain a gas that converts electric current to ultraviolet light by a process known as electric discharge. Then the special fluorescent coating on the bulb converts this ultraviolet light to visible light. What is an opaque surface? What is a translucent surface? What is a transparent surface? The angle of incidence (θi) of a light ray is equal to the angle of reflection (θr). What is the difference between a real and virtual image? What does the acronym SALT stand for? Does a diverging (convex) mirror always produces a virtual image? If an image is located behind a mirror, what type of image is it? What type of image is formed when an object is placed inside the focal distance of a concave (converging) mirror. What type of image is formed when an object is placed beyond the focal distance of a concave (converging) mirror. What two processes occur in a raindrop that causes rainbows to form? What is index of refraction (n)? Index of refraction (n) is defined as the ratio of the speed of light in a vacuum (c) to the speed of light in a particular medium (v). When does total internal reflection occur? What is a principle focus? What is the magnification of an image that is a greater distance than the object distance? Can a concave (diverging) lens produce a real image? Focal length (f) is positive for converging (convex) images, and negative for diverging (concave) images. What is the difference in the height of an image (hi) and object (ho)? ho and hi are positive for upright, and negative for inverted. Can the object distance (do) ever be negative? How is focal length (f) related to radius of curvature (r)? Measure the outside air temperature in the summer and winter. Graph and average of the daily temperature data around the world for the past 100 years. Observe the presence of icebergs in the ocean. Measure levels of current greenhouse gases. A good study will use the data over many years like the graph of average of the daily temperature data around the world for the past 100 years. This is a visual representation of the numeric data collected over as long a time span as possible for reliable data collection. The more data the better. Also a combination of many of the other data collections would be useful. Solar panels can only be used during the daytime. Where would the energy come from to power the things we need at night? The average wind turbine costs approximately $3.5 million to build and install (in 2012 dollars). Many things require fossil fuels and it would be very difficult to convert the systems that we already have to make them run on alternative energy because it would be costly and difficult to organize. People prefer to use energy from wind and solar, rather than fossil fuels, and this will make it easy to switch. A hypothesis is a proposition or explanation made without knowing the truth of it yet. This is posed as a statement (rather than as a question) and forms the basis for the research or questions that will be the scientific investigation to follow. The student must first check if the pond is acidic or not. This is done with pH paper. Pour each one back into the correct container or the locker. Make sure the sink is clear and pour them down the sink drain making sure not to splash. Put them in the garbage. Be careful! Always wear all your safety stuff in the chemistry lab! Gloves, Goggles, Protective clothing and shoes are the main protective methods in a lab. Sometimes even more protection is used depending on the experiment. Make sure to be neat and use a mechanical pencil and draw lines with a ruler. Do the entire procedure at least three times and record data separately for each. Use graph paper and not the other kinds of paper that are used in other subjects. Make sure to use a calculator when writing down the numbers. It is important to record more than one data point for each test, then these can be averaged to reduce error. A controlled experiment only changes one independent variable at a time, and measures the change or effect on the dependent variable. Is changed during an experiment in order to measure the effect it has on another variable. Is kept constant during an experiment in order to make sure any outcomes in an experiment are from other specific, known, and intended changes. Changes due to the change in another variable. Might be changed if the circumstances are right. A dependent variable changes due to the change in another variable, which is known as the independent variable. For example time is the independent variable and concentration of a chemical is the dependent variable. On an x-y graph, the 'y' values is dependent on the 'x' value. Time it takes to melt an ice cube. Colour the water turns after a colourful substance changes. A measure of how wide a colony of bacteria has grown in an incubator. The average height of the students in class 9A compared to 9B and 9C. Qualitative observations are based on descriptions from sensory information like: sight, smell, texture, colour, values like good or bad, etc. Size (small, medium, large) is an observation so it is a qualitative measurement. While mass (g, kg) or volume (mL, L, cm3) are quantitative values because they are measured. An environmental report published by an oil company. A salesman of The Fetching Car Company talking about the benefits of the cars they sell. Prejudice is present in three of the above answers. The surface of the running track. Their own reaction time or their stopwatch. The lighting conditions during the run. There are many possibilities for error in measurements. This is why it is important to take many repeated measurements and to average them together to reduce error. The most accepted unit in science is generally based on the metric system. Kilograms are SI units, so grams is the closest and most appropriate.